TORONTO, Jan. 30, 2019 /CNW/ - First Cobalt Corp. (TSX-V: FCC; ASX: FCC; OTCQX: FTSSF) (the "Company") is pleased to provide interim results from ongoing testing of cobalt hydroxide material as potential feedstock for the First Cobalt Refinery in Ontario, Canada. The preliminary test results reported today provide further confidence that the First Cobalt Refinery flowsheet is suitable to receive cobalt hydroxide feed material. "Today's results give us further confidence that the First Cobalt Refinery flowsheet can produce cobalt to supply the North American market. Having achieved this milestone, we are driving ahead with the next phase of testing including the production of cobalt sulphate, which we expect to have completed before the end of the quarter. The lower price of cobalt hydroxide on the market today points to increased margin potential through upgrading readily available supply of cobalt intermediates. We continue to explore sources of non-equity capital to finance the recommissioning of the Refinery, which could provide cash to finance future work at our flagship Iron Creek Cobalt Project in Idaho, USA." 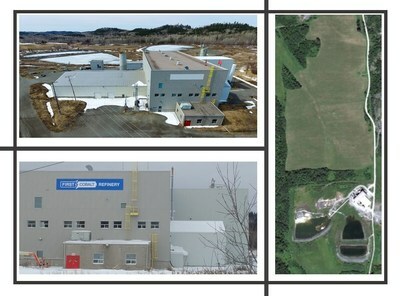 In late 2018, SGS Canada was engaged to test cobalt hydroxide with the existing flowsheet of the First Cobalt Refinery to determine whether cobalt hydroxide could be suitable feedstock for the Refinery (see November 8, 2018 press release). The existing flowsheet includes an autoclave circuit and a number of solvent extraction ("SX") processes for treating various elements, as well as product precipitation and filtration stages. The testing by SGS Canada simulates these circuits to determine the ability to process cobalt hydroxide into cobalt sulphate heptahydrate ("cobalt sulphate"), a critical component of lithium-ion batteries.